2013 will always be known as one of my most bitter-sweet years. Tragically, both my mother and father passed away in matter of 7 months and I bade farewell to my career as a lawyer. After these events I could no longer ignore the voice in my head and was adamant that I should pursue my dreams – fired on by my longing to make the most of the time we have on earth. 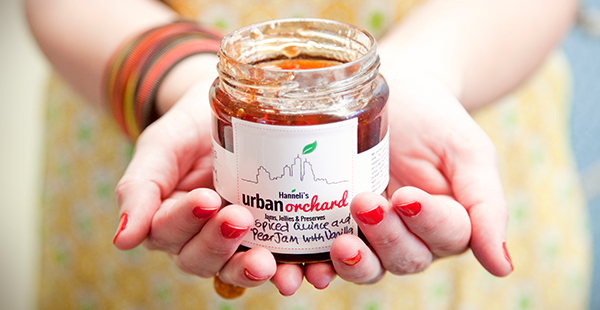 As a result, Hanneli’s Urban Orchard was born: an artisanal jam-making business with a conscience. Although my jam-making experience was limited to watching my expert jam-making-mother-in-law, I had no doubt that creating this wondrous sugary substance from urban-grown fruit was the catalyst to fulfilling my creative ambitions. Combining my love for people, the community, the longing to make a difference and the philosophy that a little good can go a long way, a niche business was born. The fruit I use are grown by passionate people, mostly based in the Northern Suburbs of Cape Town. This fruit is sourced from urban gardens and picked from neighbourhood trees. It provides the growers – mostly pensioners and elderly people – with a source of income and a sense of pride. Every jam has a story in it – a journey in a jar. Sommer spoggerig daar uit die Oakdale! Voorspoed met al jou planne.